Bliss Dance is an original 40-foot sculpture by artist Marco Cochrane. Without the aide of computers, the artist constructed Bliss out of steel rod and tubing utilizing two (2) layers of geodesic triangles, covered by a skin of stainless steel mesh and lit from both inside and outside by 1,000 LED lights controllable by a customized I-Pad application, with spectacular results. Held together by 55,000 welds and supported by six (6), 2.5-inch solid steel rods in the weight bearing ankle. Weighing in at 7000 pounds , Bliss was a manifestation of the artist’s goal to marry the masculine feel of triangles, trusses and steel with the feminine form and spirit. 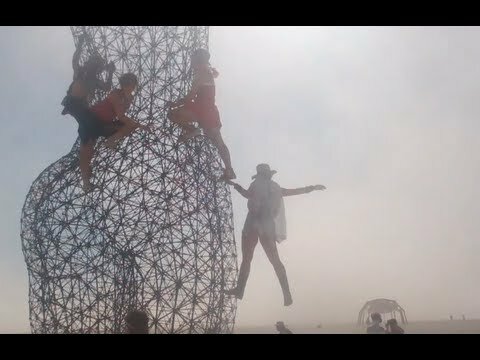 Although Bliss Dance was inspired by (and created for) Burning Man, it is available for all the world to enjoy at Treasure Island. 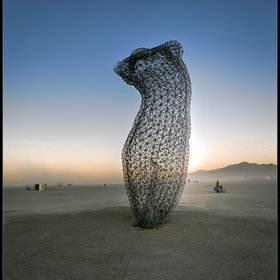 Truth and Beauty was half-finished for 2011’s Rites of Passage, and the torso made an appearance on the Playa.